We’d love your help. Let us know what’s wrong with this preview of The Invention of Paris by Eric Hazan. On y voit naître, au rythme des enceintes successives, l'éclairage public, l'enfermement des pauvres et des fous, le numérotage des maisons, les terrasses des cafés et la police de Places royales et faubourgs brumeux, enceintes, barricades et passages, c'est la trame serrée des quartiers parisiens qui organise cette déambulation proposée aux flâneurs des rues et des livres. On y voit naître, au rythme des enceintes successives, l'éclairage public, l'enfermement des pauvres et des fous, le numérotage des maisons, les terrasses des cafés et la police de proximité. Du Marais des Précieuses au XIe arrondissement des "branchés", on assiste aux migrations de la mode, à l'apparition de microvilles dans la ville, celles de Scarron, de Des Grieux, de Desmoulins, de Rubempré et de l'autre Lucien, Leuwen, celles de Gavroche, de Baudelaire et de Manet, d'Apollinaire, celles encore de Nadja, de Doisneau ou d'Anna Karina. To ask other readers questions about The Invention of Paris, please sign up. Hazan takes the reader on a tour of Paris across time and space, blending psychogeography and history with great panache. I have a longstanding fondness for Paris and its revolutionary upheavals, so found this fascinating. Hazan’s narrative is dense with references and quotations, which reignited my interest in 19th century French literature. (I still haven’t read any Proust and hardly any Balzac, etc.) The book is structured in three parts, the first and longest a geographical tour of Paris Old Hazan takes the reader on a tour of Paris across time and space, blending psychogeography and history with great panache. I have a longstanding fondness for Paris and its revolutionary upheavals, so found this fascinating. Hazan’s narrative is dense with references and quotations, which reignited my interest in 19th century French literature. (I still haven’t read any Proust and hardly any Balzac, etc.) The book is structured in three parts, the first and longest a geographical tour of Paris Old and New. It doesn’t matter whether you’re familiar enough with the city to follow this on a map, Hazan carries you along with a very evocative account of the roads, structures, and people that have made Paris over the centuries. This is followed by section titled ‘Red Paris’ with a narrower focus on the revolution of 1848 that established the second republic. I wasn’t very familiar with the events of 1848 in Paris specifically, having mainly read about them in a wider context (Hobsbawm’s The Age of Revolution: 1789-1848 and Gildea’s Children of the Revolution: The French, 1799-1914). This section was therefore the highlight for me, as it demonstrated how the brutal suppression of a worker uprising prefigured the Commune two decades later. Hazan also links it with the 1851 coup d’etat and sees 1848 as the point of schism between the bourgeoisie and proletariat, who had managed a sometimes uneasy solidarity since 1789. 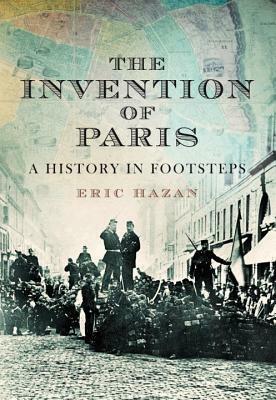 Hazan skillfully conveys that the revolutionary ferment in Paris during the 19th century is literally inscribed in its streets, whose layout and names have changed as empire, monarchy, and republic succeeded one another. This is of course part of why Paris is so interesting. The tone here is sympathetic, which I approve of. In the third section of the book, the artists, writers, and in particular photographers of the city become the focus, as their works cannot be separated from the locales and times in which they lived. In particular, the discussion of Baudelaire and Manet reminded me of how much contextual information and nuance we miss today when reading or looking at 19th century artworks. Ridiculous as the comparison might seem, there is a similarity with internet memes. These rely on often quite obscure and detailed references to arouse an amused response. The turnover of images might be much faster these days, but it’s telling that Manet evoked vehement emotional responses with pictures that seem entirely innocuous today. Moreover, the political symbols now used on the internet owe something to Dada and the Surrealist photography of early 20th century Paris. If it is true, as Michelet put it, that each epoch dreams the following one, it is even more clear that each epoch lives in nostalgia for its predecessor, above all in a period when this sentiment, promoted like washing powder, fits marvellously into an ideological scaffolding, the strategy of ‘ends’ - of history, of the book, of art, of utopias. Turbulent Paris is on this list of programmatic ‘ends’, which does not prevent the necessary measures being taken to conjure away those spectres that some people fear, not without reason, will return to haunt their streets. Highly recommended for urban studies enthusiasts and footnote fetishists who have a working knowledge of Paris or a desire to acquire said knowledge. Have a good map of the city handy when you embark on this erudite voyage. Such a riveting theme, yet the text is not captivating. And to understand the book in its entirety and as it should be understood, one must know very well of Parisian history and geography. It is a book made for Parisians, and only those who have studied their city with passion. Read by ACRL Member of the Week Piper Martin. Learn more about Piper on the ACRL Insider Blog. As I read through the first section, I wanted to visit Paris and see for myself the places the author describes. As I read through the second section, I wanted to move to Paris and live there for a month, doing nothing but wander the streets with the book in my hand, following the author's narrative. By the end of the book, I realised that I'd have to live until I was 100 - and move to Paris tomorrow, never to leave - to fully explore the city and its history, culture, geography, mythology, people As I read through the first section, I wanted to visit Paris and see for myself the places the author describes. By the end of the book, I realised that I'd have to live until I was 100 - and move to Paris tomorrow, never to leave - to fully explore the city and its history, culture, geography, mythology, people and panache that the author has crammed into this book. A Paris of writers and revolutionaries, poverty and princes, Empires and Republics; a city of delights, of Terrors, above all of life lived at full tilt. In places this book left me breathless. An impassioned account of how revolutions and uprisings, especially, colour Paris’ past and shade its present. The book gives a powerful overview of how forces of control, revolution and reaction have literally shaped Paris and influenced its topography and structures. On a personal note the book reinforced how weak is my detailed grasp of French history. Unless you have an impressive photographic/cartographic recall of Paris streets the book is probably best read with a decent map at your side. PS An impassioned account of how revolutions and uprisings, especially, colour Paris’ past and shade its present. The book gives a powerful overview of how forces of control, revolution and reaction have literally shaped Paris and influenced its topography and structures. PS You get the sense that Hazan REALLY doesn’t like Mitterand’s Opera. Irresistible like a crême brûlée, it will make you want to book a trip to Paris tout de suite to see for yourself the incredible, beautiful, insane things it describes. It's primarily a book for hard-core Paris groupies. If you're not one yet, you will become one after reading it (there's a German translation, but I don't know if it is available in English). I think that in order for this book to work one must have a significant background in Parisian arts, history, literature, and philosophy. A great undertaking and an excellent project for those with the knowledge. This is no light read aimed at someone wanting a concise history of Paris. The quotes, casual references and throw-away tangental come thick and fast and unless you are familiar with every poet, writer and historical figure that has some association with the city, this book is very hard going. This is super; heady mix of history, literature, and geography, as well as a hefty later chapter less on the general theme of the book and more specifically about the history of street revolutions in Parisian history. Fascinating and really well researched. It's a tour of the city over time. Great book about Paris, especially the second part which deals with the social and political history of the city. A good knowledge of the city is mandatory to be able to enjoy the book. Another 'hidden histories of Paris' type of book. Verso put this out, and they usually do great books - so I am looking forward to this one. Un livre sur l'histoire de Paris passionnant et foisonnant, engagé et éclairant. Indispensable pour tous les amoureux de la capitale.